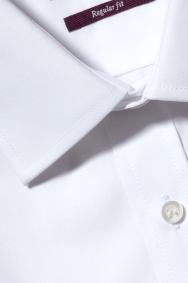 Your search for a fuss-free, double cuff white shirt is over. 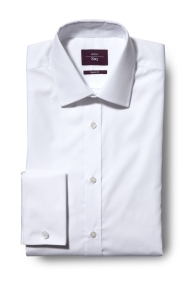 Looking snappy in a hurry isn't a problem when you can lay your hands on this easy care shirt from Moss Esq. Thanks to its cotton and polyester fabric, and taped arm seams, only a quick run over with the iron is required. Select your favourite cufflinks and you'll be out of the door in no time. For a no-nonsense workwear look, team this shirt with your choice of regular fit jacket and trousers from our collection. A regular fit shirt is the epitome of timeless style and smart yet comfortable dressing. Generously cut around the chest and shoulders for a relaxed fit, a regular fit shirt makes business dressing effortless. Simply team it with a pair of regular fit trousers to stay sharp all day and add one of our statement ties in a vibrant colour to pull the ensemble together. Nice to have a shirt I can still breath in. Great quality and fitting. I always get my husband's shirts from Moss. Materiale scadente, al di sotto delle aspettative. The shirt has an is exquisitely smooth feel on the skin. Also fits just right. simple cheap arrived fitted me. Het kledingstuk paste ideaal bij mij. it fits well and looks nice. I haven't tried on my suit or my new shirts yet but I know they are excellent! Fits well, brilliant white and good texture. Great shirt for the price. Quality material and nicely tailored. Smart and good fitting. Perfect collar size. Excellent shirt at an excellent price. Excellent quality. Will look the part on a special occasion. I love this shirt. It is such good quality and excellent value for money. Fabric is too thin. I returned it. Good shirt, shame it doesn't have slits for collar stiffeners. As description online. Sale item so good value. Good quality item for a reasonable price. As described ! Fits like a glove Quality item ready for my daughters wedding!!! Thank you for the discount!! I needed a shirt for my wedding, this was just what I wanted. Looks smart bought for a forthcoming wedding! Basic white shirt that was a very good price. Lovely fit, really pleased with it. shirt fitted well and washed well. I had looked at other shops previously but moss had everything in one place it made life so much easier. Ease of ordering , delivered fast , quality goods . Good quality with generous material.not skimped like many shirts today. Top quality product. Really comfortable. Good quality shirts, pleasant to wear. Excellent product, exactly what I wanted. Exactly what it says on the tin. Plain white shirt. To be honest i did purchase the same once from the store so all i did was go in to the website and order again. I purchased a moss white shirt, I wear 15 1/2 but this particular shirt seemed too big around my neck. After putting on the tie it makes the neck look too tight and unconfortable. Lovely shirt, and fits well. The upsell of cufflinks would be an idea. Standard white shirt. Not the best when Ironing with creases visable in certain lighting. Good quality and fits really well. very good non iron shirt. Great quality and fit !!! i wasn't keen on the fit as i like skinny shirts. the shop in Manchester exchanged this for me no problem. If you like average fit shirts im sure you'll be happy. An average shirt. Non iron is a bit of a joke, if you don't iron it you look like you've slept in it! Shirty was excellent. Good cuff-length, fit was great. at last a shirt that really fits me well. Great shirt and fitted well and having a bit of a fat belly it was long enough to stay tucked in. Perfect fit with the extra long sleeve. Perfect shirt for my job interview. Fitted perfectly and reasonably priced. Fitted perfectly very comfortable . As the sales person suggested, it has washed beautifully and therefore was an absolute bargain. Super quality! Extremely happy with my purchase. With respect to all the shirts on the order - I'm glad I ordered the next size up from my normal, I love regular fits particularly and often comfort fits after that but whilst on this order the neck size was perfect (and maybe looser than normal for me) the body fit was less loose then I might have expected. My normal size in one or two other brands I usually buy would be more roomy then the size I purchased on this order, but that's just me. However now I have a feel for the sizing and the product I would certainly buy form this shirt range again. Not quite to the quality I would have bought and would be disappointed had I actually bought it, however, they were complementary. Collar size great but regular size didn't fit need to do bigger size than regular! A nice fit and feel to the material. The Regular size was much too small. Good quality cloth and well balanced. Size correct for what it is. Nice shirt although a little see through. Excellent product, good quality look and feel. Lovely shirt great quality. 3 for £50. Just a very poor experience. Sent a message online and have had no reply. Tried my luck with twitter and again no reply. Seem to be good, but not used yet. Look fairly good quality. Good quality shirt for a good price. Still needs an iron though! I speciffically told the sales assistant i did not want to be contacted by any email correspondence. This is exceptionally disappointing. The customer assistant did not measure me for this item correctly. Bit soon to tell but seems perfect. Used many times , always good prompt service with delivery. An excellent shirt and well packaged. Friendly, helpful and service with a smile. Couldn't ask for more. As described and good quality product. Feel fair quality given price point. Has a good cut and look. I assume! They are locally known as funeral shirts so I have yet to wear them and hopefully not too many times...............................!